Twin Galaxy luxury residences is a project being developed in the heart of Johor Bahru city and is only two kilometers from the Customs, Immigration and Quarantine Gateway to Singapore. This modern and upmarket apartment project lies the financial hub of the Iskandar Malaysia Corridor, a strategic development project by the Malaysian Government aimed at transforming J.B. into a new urban metropolis of international standing. 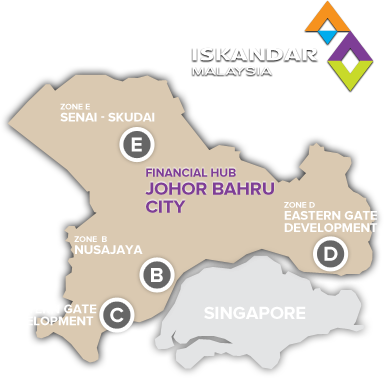 As part of the development of Iskandar Malaysia Corridor, five zones have been designated for development to enhance the city as an active commercial hub. Twin Galaxy’s prime location within the Iskandar Flagship Zone A district gives you easy access to transportation hubs such as the Zon Ferry Terminal with ferry routes to Indonesia and Singapore. 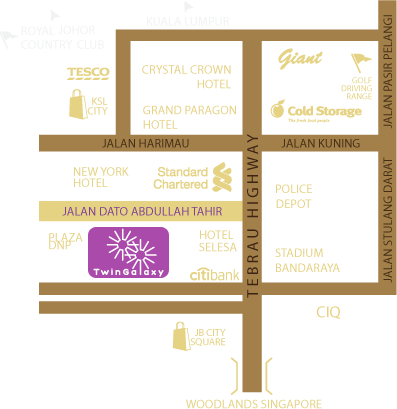 Ideally located along the newly christened Uptown Walk of Jalan Dato Abdullah Tahir, Twin Galaxy Residences comprises of two 35 storey mixed development towers that is in close proximity to shopping malls, cinema multiplexes, supermarkets, banks, hospitals, international schools and colleges. Twin Galaxy aims to set the benchmark in the prime luxury residence market with a host of world class facilities and amenities created with you in mind. From the splendor of the grand entrance to the 11 lots of shops and international fine dining establishments, our architects and designers have carefully crafted a new world or experiences to pamper your senses.